THE EDITOR: Wake Me Up went through a community of editors under first publisher. THE PUBLISHER: The Author’s Advocate is the second publisher of Wake Me Up after Gravity folded last May. The Author’s Advocate is an Author Consultant and Content and Development Editor Service. This new publisher has put out all Justin Bog books. SUMMARY: Wake Me Up began as a meditation on psychological stress and depression in men in their middle ages. Research helped me flesh out the father in the story, what he was trying to fight against in his own nature. His son and wife play heavily in his thoughts and he fails to realize he’s losing control. At the same time, his son is struggling with his own identity as a fifteen-year-old in a small college town in conservative Montana. He becomes the victim of a bullying attack by four of his classmates. From his coma, this teenager begins to tell the tale of secrets held for generations by his family. He floats above the action, privy to everyone’s thoughts and actions around him. He’s trying to heal, and hopes to confront injustice upon doing so, if he wakes up at all. 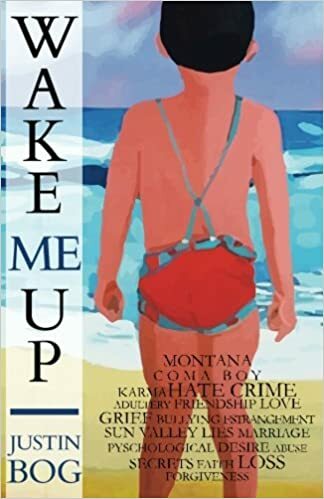 THE BACK STORY: I decided to write Wake Me Up as a reaction long ago to the brutal murder of Matthew Shepard in Wyoming in the late nineties. While writing about my own hate crime, two people were attacked in Montana in a similar manner to what I had created, reality following fictional imaginings. This told me the story needed to be out there for more people to see. It’s an emotional read. Wake Me Up took three long writing sessions over months and months, years and years, with a few long breaks in between. When I completed the first draft, I sent it out to be Edited for development and then worked on dozens of drafts until I was satisfied I could let it stand out on its own. The narration is from an impossible place, sort of in The Lovely Bones vein, with a boy telling his story from a coma. He learns the most devastating secrets this way, and I enjoyed the challenge of getting his voice right. He’s an introverted genius only beginning to realize he’s been floating by because he was becoming invisible to his family and the townspeople around him just when he needed connection. I did not want to sensationalize or exploit a known crime; what happens to the main character in this attack is as realistic as possible, and the other characters explored add color and texture to the tale. WHY THIS TITLE? : Wake Me Up becomes the call and response within the narrator’s mind as he struggles to both wake up physically from his coma and emotionally as well since he’s learned so much about the lives of his family, his extended family, and what made him act the way he did at times, for good or bad. WHY WOULD SOMEONE WANT TO READ IT? Wake Me Up is a family, psychological, literary crime novel that anyone who reads the books of Donna Tartt, Margaret Atwood, Joyce Carol Oates, Alice Sebold, and John Irving may enjoy. It is heavy on character, what makes people tick, and the narrative develops because of the characters and who they interact with. There are several other novels where the narrator is telling his or her story from an almost impossible realm or place. The Lovely Bones is only one. There’s a killer novel titled Security that is being told by an instantly paralyzed security guard who fell onto a desk in front of all of the video screens showing the hotel complex that is about to have a grand opening. He can’t move. The bad guys around him think he’s dead, but he’s listening and watching and to say more would ruin the surprise of what comes next. I like this tension between character and narrative, and the stronger the characters, the better the story. The book becomes memorable because readers share their emotions. “A Kafkaesque literary trip through the brain of a brutally assaulted teenage boy whose supercharged perceptions expose the secret sins of those he wants to love and hopes to believe in . . . The genius of author Justin’s Bog’s first full-length novel is that though everything Chris “knows” and recounts in his inner monologue is mysterious, maybe mystical, there is no hint of hocus-pocus, nor of the vague disjointed dream sequences one might expect from an unconscious protagonist . . . In the brief lead-up and denouement we see reality clearly: the attack and the aftermath. In between, everything that “happens” to Chris in his shut-off state is just as real and just as believable-but impossible. It would be hard to identify a literary precedent for this method of construction–Franz Kafka, perhaps, meets Lewis Carroll.”—Chanticleer Book Reviews. “Justin Bog punctuates the sexual stigmatization that results from a bigoted societal mindset in Wake Me Up. Divided into four sections, Bog uses the Greek Chorus in parts one and four to present the collective voice of the many characters of whom Chris (the narrator) observes during his astral travel . . . Bog’s attractive writing style, set to present tense, combines storytelling via the narrator and engaging dialogue . . . Wake Me Up is well written, thought-provoking, and a definite must-read by all.”—Anita Lock, Manhattan Book Review. “(Wake Me Up) is Justin Bog’s most extraordinary book to date, and an absolute masterpiece! Intensely written, this is the tragic story of a teenage montana boy who lies at the heart of this tale, comatose after a brutal beating fueled by hate, and the chaos that ensues after the attack. all told through the eyes of our victim and hero, Chris Bullet. 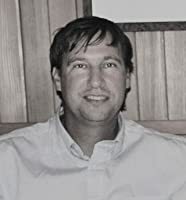 The author weaves the story together as a group of individual stories as witnessed by Chris almost supernaturally in his altered and ethereal state. brilliantly crafted, complex, and beautifully written! I cannot say enough great things about this fine book, and happily encourage everyone to read it. It is a story of the injustice of our times, and I believe it will be a story that will stay on the shelves long after our times have all passed. If you read nothing else this year, please read this. five + stars.”—Hogwash, Bradley Knox. AUTHOR PROFILE: I wrote skits, my own SNL plays, as a teenager after discovering an old typewriter in the attic. This and my love of reading continued to make me love writing and creating my own stories, the kind I enjoy: complex stories of people overcoming tragic circumstances, or failing. Crime and Punishment and The Count of Monte Cristo were two touchstone novels that inspired me to no end as an author. I then loved reading the short stories of Shirley Jackson, Raymond Carver, Margaret Atwood, and Stephen King. I tend to write about dark places and the people who haunt them, and this year’s work proves that point. Next Project? A series of four horror novellas in the dark psychological and supernatural realms. AUTHOR COMMENTS: The issue of social injustice is huge, and battling against those who wish to put people in a box and judge them. The teenager in Wake Me Up is struggling with his own sexual identity, as most teenagers going through puberty do, but what happens to him forces him to realize why his sexuality has brought him to be a victim of the bullies around him. These bullies suspect that he’s gay and want to punish him for that, ridicule him, make his life miserable. They end up doing that and more. The social issue is there as subtext since a story has to stand on its own, the characters must become round, real in their situations. It’s not there be the main point either. A story must be found to be true within the lie of fiction. PRICE: Wake Me Up is $16.95 for paperback and $4.99 for kindle. Wake Me Up is a long, complex novel of 400 pages and there is a book club reader’s guide at the end of the book with twenty questions perfect for discussion. My first literary crime novel, Wake Me Up, is available from Amazon, being highly reviewed, and compared to The Lovely Bones in terms of narrative suspense. Also, HARK: A Christmas Collection, a group of holiday tales for adults who crave something deeper in their Christmas stories, is now available from Amazon!